Putting up Halloween decorations today reminded me it won’t be long before I’ll be struggling with hanging the Christmas lights. I’m always looking for a better way to hang lights, and I think these stainless-steel loop hooks from Lee Valley look promising — a lot more promising than plastic gutter S-hooks that can pinch your cold fingers. Think of an eye hook — now bend the tag end perpendicularly away from the shaft and squish the loop so the tag end overlaps the loop. The hook that’s left completely captures the wire, yet you can easily remove the it without backing the entire string through the eye. The loop hook can accommodate wires up to 5/16″ in diameter. 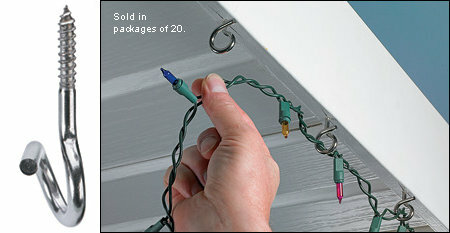 A package of 20 loop hooks will run you $13 before shipping. I usually use these and cable ties..
You can add a flathead screw if needed. Unless you’re trying to keep your lights up in a hurricane, cup hooks are quite sufficient. With cup hooks, I can put up all of my lights while standing on the ground using a broom stick with a nail sticking out the side as a hook. With these new hooks, I’d have to drag out the ladder. No thanks. I was looking for a way to split my trim – these look like a great way to do that. Cool, looks like an answer for me. Gotta get all my green lights up before the ‘Riders win the Grey Cup. Dave’s got the plan. I’ve used brass cup hooks for 35+ years with no issues. I thought ‘pre’-drilling was getting the drill out of the case and making the hole was drilling. Ha ha! Too funny. Drilled and pre-drilled. It’s like how shelled nuts and de-shelled nuts are the same thing. And flammable and inflammable. You could probably cut a short slot in the end of a broomstick for the wire and use that to manipulate the wire into and out of this hook. The point is you put the hooks up and leave them there permanently, so each Christmas you just put up the lights on the hooks that are already there. Makes decorating really easy!